March 26, 2012 by Venky. What would you look for in an ideal commute bike? Fenders: Who would want to muddy their work clothes on those rainy days? Racks: Who would not want to take the load off their backs? Being reasonably cheap/economical: Sure, who wants to go all around town and park an expensive bike wherever you go, without becoming a nervous wreak? Doesn’t score badly in looks department as well: Sure, why not! I would like even a cheap bike to look good. I found all of them in “Hero Thunder Racer” in the Desi bike segment. You have a good *reasonably* light weight frame that takes fenders and racks and comes with fenders installed. It comes with reasonably lightweight alloy rims and 27×1-1/4″ tires which can be quick with minimal rolling resistance while still not making you shudder at the prospect of riding in the crater filled roads on wiry thin tires. 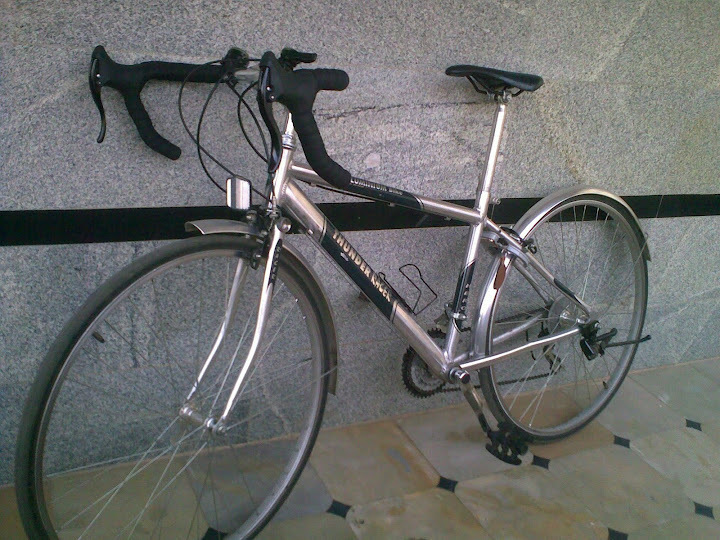 Interestingly, when I was looking to start cycling back in 2008, by commuting to office daily, the Thunder racer did make it to the top of my list. Unfortunately, it was out of production by that time. I could not find any old stock of the bike in any of the shops in Hyderabad at that time.So, I ended up buying a Hero Hawk. When I saw an ad for sale of a Thunder racer on BZ by Noel, I showed interest because, my brother was looking for a bike he could use for his occasional commutes. Before modifications.. In stock avatar..
One look at the bike and I knew that the only major crappy thing on the bike is the brake lever setup. Fortunately, I remembered that a while back a friend on BZ, Abhishek, offered me the aero brake levers that were lying around with him unused. So, I contacted him if they are still available and picked them up the day after I bought the bike. Thanks a ton for the levers, Abhishek! The stock saddle is wide and has springs to cushion you from the road buzz. I thought it is quite decent. However, I decided to replace it with a sleeker and firmer saddle that a friend, Jagannath Moorthy, was giving away as it was lying unused. Thank you for the saddle, Jagan. The stock metal pedals were replaced by plastic ones and Noel could not find the original pedals. So, I’m going to replace them with some classic road pedals like those on my Hero Hawk. Replaced the brake cables as the old ones proved too short to be routed from below the bar tape. After adding Aero brake levers, bar tape and a better saddle.. In its new look.. It looks a lot better after the little makeover, but there are a few issues that need to be sorted. The side walls of the Aluminum rims on the bike are so smooth that the break pads slip a lot and makes braking ineffective. I need to get better brake pads for it. I considered changing the shifters to down tube shifters like I did on my Hawk but the huge down tube doesn’t quite allow that. May be bar-end shifters are a better fit for the bike to give it a classic look and clear the handle bars of those stock plastic shifters. I left them unchanged for now as my brother, being a first time user of gears, might find their indexing capability and their current positioning handy. I’m impressed with the frame. Although it is not lightweight by the standards of imported aluminum frames, it definitely looks sturdy and since it has all the eyelets for mudguards and panniers, I think can be a good frame for some light touring. No wonder that an avid tourer like Shree Kumar has used it for a long time for touring earlier. Another tourer Sudipto has used bikes like Hero Top Gear(old) and Hero Thunder MTB extensively for touring. PS: I’m sure many have been using similar desi bikes for commuting/touring for a long time with or without any modifications. Leave your comments on what in your opinion makes a good commute and/or touring bike and which bikes in your opinion fall in that category in the Desi bikes available locally. Next Delliwala Attacks Nandi: A Funtastic Weekend Ride..
Nice work. It is the first I have seen of this model, looks nice. Pity they discontinued it. What is the fork made of? Thanks Arvind! The fork is also aluminum. hey , i think its still in production.. found this link http://www.herocycles.com/thunderracer1.htm..
Hey Smitesmote.. Although the link is there(through which I got to know about the bike in the first place), whichever shop I visit says the same thing. They say its not in production anymore and is found rarely where very old stock is there. i found one in bangalore .. it's in stock condition too.. but the shopkeeper's asking around 10k for it.. and says that there is no single speed version .. at that price it is too much..
all the bikes in his store his over-priced according to me.. cant find the the thunder racer anywhere.. Yes, 10k sounds overpriced. I remember it being retailing for around 8k which I thought was a decent price. one more thing .. suggest a cycle with a dropdown handlebar for a person of 5'6 height (me).. I think for a height of 5'6", the desi road-bikes(Hero hawk and BSA Mach) are pretty much ruled out since they come with one frame size and it is quite large. Thunder racer might fit you but then you're saying that the shopkeeper is quoting more. There are other options in BTWin and KHS which come in multiple sizes but are all in the range north of 20k-30k. you seem to know a lot about modding cycles..should i just add the drop down handle bar to the mach city ? add the drop down handle bar to the bsa photon ex?? I know it sounds like a dumb question but i'm new to cycling and i really like the drop handle bar on my friends hawk when i rode it .. so i thought i could mod the photon with the dropdown handle bar..
Two things you got to keep in mind when adding drop bars for these bikes are: 1. The reach to the handlebars when you are seated. That is, the sizing could be effected. 2. Cost. If you are looking to get this done at a local shop with drop bars and brake levers from a bike like Hero hawk or Mach, it might not cost you much but anything more is going to cost as much as the bike itself. I would suggest that you ride these bikes as they are for a few days and see if you still want to change to drop bars. Otherwise, buy Thunder racer directly after ensuring that it fits you. thank you man.. for clearing my doubts.. i knew that the reach of the handle bar will be a problem.. sometimes the riding position may become too awkward right? anyway thank you very much for helping me out..
the photon is a perfect fit for me(rode it).. i'll ask a good bike dealer and see if he can set me up properly..
Good morning! 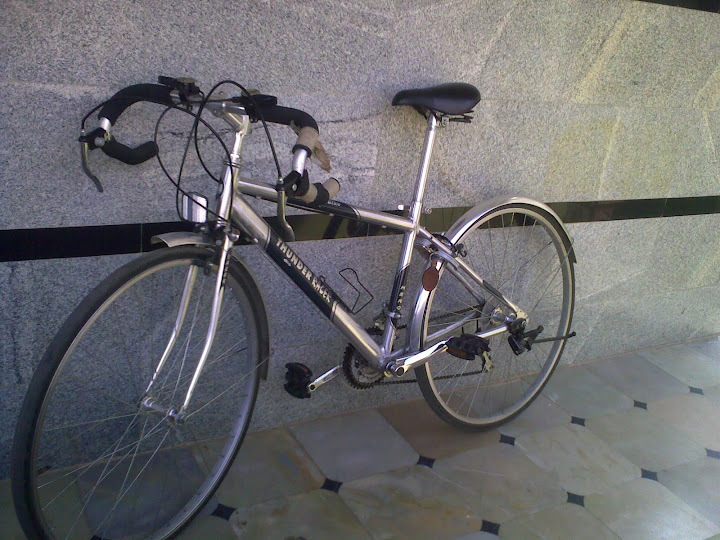 I'm considering getting back to cycling after a gap of over 40 years and found an aluminum Hero Thunder MTB lying unused at home in Bengaluru, needs a lot of work for sure. The choice for me is between a brand new single speed roadster and fixing this one. I especially like the option of a rear wheel mudguard on this model. Single point question is this – with an overweight 100+ kilos, would this bike be OK? It looks strong!